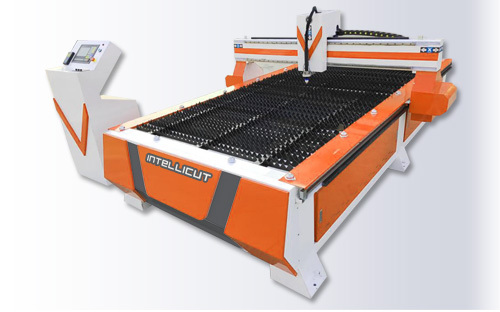 IntelliCut Excel CNC Plasma Cutting Table. It's not every day that we truly amaze a customer with insights into streamlining his business costs, workflow and radically reducing his time to market. Often, the return on investment argument must be satisfied with some in depth discussion and analysis of his business. However, using Hypertherm Pronest LT 2017 software simulating the performance of our IntelliCut Plasma Cutting table we were able to provide a customer with a 'no brainer' argument for investing in one, in a very short space of time, whilst debunking the myths of poor cut quality and slow performance, thanks to the excellent quality of table and power sources from our manufacturer, CNC Clearcut. Our customer produces canopies for standard and field service vehicles, off road vehicles, roll over protection and more. Currently the longer cutting work is outsourced, whilst any shorter cutting is done by hand, in house along with the drilling, grinding, finishing and assembly. Most of the work is done using 3mm aluminium for the panels and the thickest parts, such as hinges and brackets are 5mm thick. The time to produce the outsourced cutting was difficult to estimate, given the parts are ordered for cutting at another factory, and then transported. However, this has its own problems - scheduling, quality and more. We estimated that to cut and drill all parts required for a canopy, without finishing and assembly work, was between 4 and 6 hours. After a visit to site to understand the customers process we set to work. Example Pronest LT nesting, showing the software in action. Using drawings supplied by the client, we were able to nest a complete canopy build as efficiently as possible, avoiding waste and maximising the performance of the cutting table, using Hypertherm Pronest LT. Then, using the advanced costing analysis system baked into it, we built a scenario for the client, based on the material, model of machine and cutting source we recommend for his production. Then we issued a report of the results. What followed was a very pleasant surprise! Actual customer part report, showing cutting times and cost per part. The report totals on the final page. Time to cut entire profile set for 1 canopy < 2hrs. There is of course finishing and assembly required, but even so - the results speak for themselves! Needless to say, our customer has placed his order for his IntelliCut Plasma table. He is looking forward to reducing his running costs, and time to market. Further, he can now start his plans for expanding his line of products and making in roads in to other areas of the market with confidence. A win-win for everybody!